Whose aid is most effective? Are generous donors less effective? This blog post, co-authored with Petra Krylová and Theodore Talbot, first appeared on Views from the Center. When it comes to development aid, you might think that there is a trade-off between head and heart: that more generous donors would be less serious about making sure that their aid is used properly. 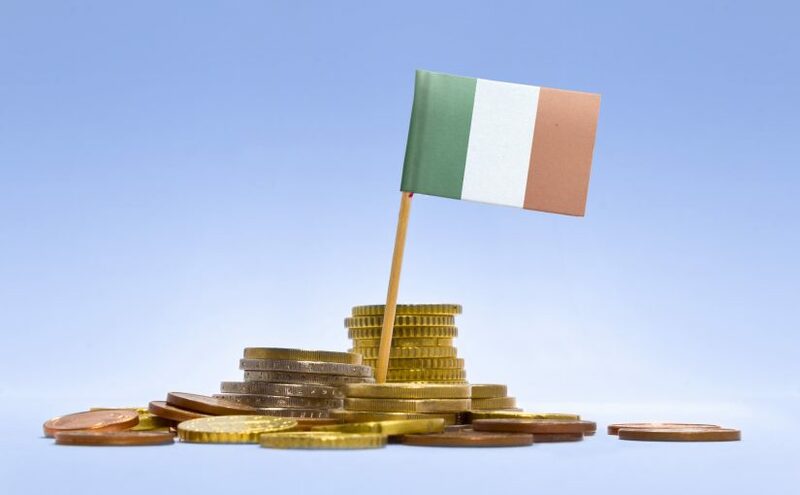 There are some examples of this: Luxembourg has a large aid programme which appears to be relatively less effective compared to its peers; whereas Ireland, which spends a lower proportion of its national income on aid, has the most effective aid programme among the donors we were able to evaluate. But in a new CGD working paper, we find that these are indeed exceptions. In general, more generous donors tend also to be the most effective. One possible explanation of this correlation is that much of what we consider to be effective aid involves donors putting the interests of the intended beneficiaries of aid ahead of the interests of the donor country. For example, untying aid makes it more effective, but requires a greater degree of self-sacrifice on the part of donors than if their own contractors are given preference. Longer-term aid tends to be more effective, but gives the donors less room for varying its aid according to political or commercial expediency. Consolidating spending on more, larger projects lowers the serious administrative burden on cash-strapped countries and organisations, but means donors cannot influence (or stamp their logos on) as many programmes. Our analysis is consistent with the idea that if a country has the political context in which it is inclined to be generous to the world’s poor, that manifests itself both as a willingness to give more aid and a willingness to put the effectiveness of aid ahead of its shorter-term commercial and strategic interests. In the Commitment to Development Index, aid is only one of seven components which we use to rank developed countries according to the extent to which their policies and behaviours promote development. (The others are trade, security, finance, migration, environment, and technology.) Within the aid component, as you would expect, we use measures of both quantity and quality of aid to score the donors. We have recently updated the way we do this, described in detail in our new paper. Aid quality is a score derived from the Quality of Aid Index (QuODA), which is produced jointly by CGD and our friends at the Brookings Institution. QuODA scores aid agencies along 31 different indicators (organised along four different dimensions) of what donors themselves say makes aid more effective, such as responding to country priorities, untying aid, using country systems, and making aid more transparent. We look at both the quality of the countries’ bilateral aid agencies, and the quality of the multilateral organisations through whom they choose to spend their foreign assistance. And for the quantity of aid, we use the internationally-recognised measure of Official Development Assistance (ODA) as a share of Gross National Income. 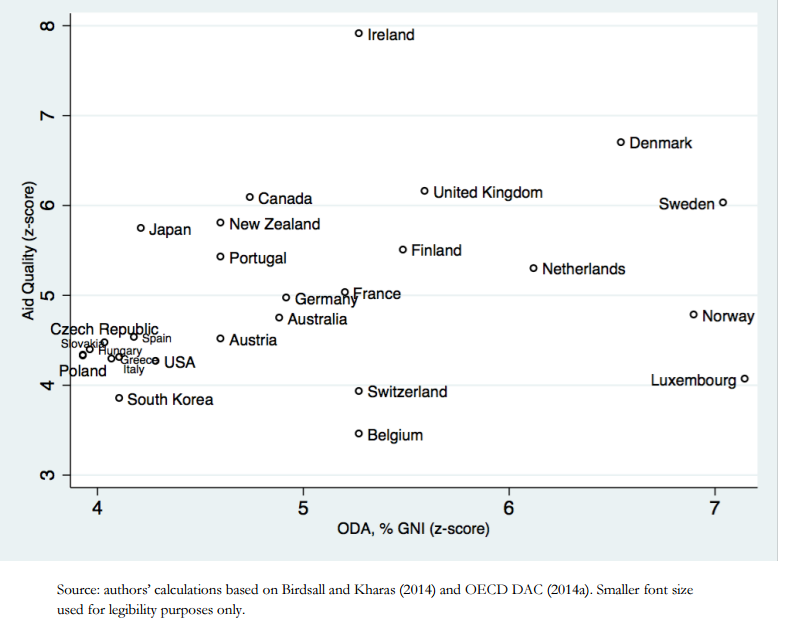 As the graph above shows, donors like the US and South Korea (in percentage terms, relatively ungenerous compared to other rich countries) tend to have the least effective aid, at least as measured by what the donors themselves consider to be important. Generous donors – notably the Nordics and the UK — tend also to be effective. And there is room for improvement: for any level of aid spending as a share of national income, there is significant variation in how well that aid is spent. Belgium and Ireland give similar levels of aid as share of national income, but according to our numbers Ireland’s aid programme is the most effective and Belgium’s is the least. This means that countries can (and should) both meet their international obligations to invest 0.7% of GNI as aid, but also work on improving the quality of the aid they spend at whatever level of spending is politically feasible. What’s the trade-off between generosity and effectiveness? Would a 10% increase in the effectiveness score compensate for a 10% reduction in our measure of the volume of aid? The short answer is that we do not know: there is no empirical basis on which to calibrate this. That is in part because donors don’t collect and publish much information about the impact of aid programmes, and partly because the aid effectiveness consensus is underpinned more by assumptions and anecdotes than by hard data. 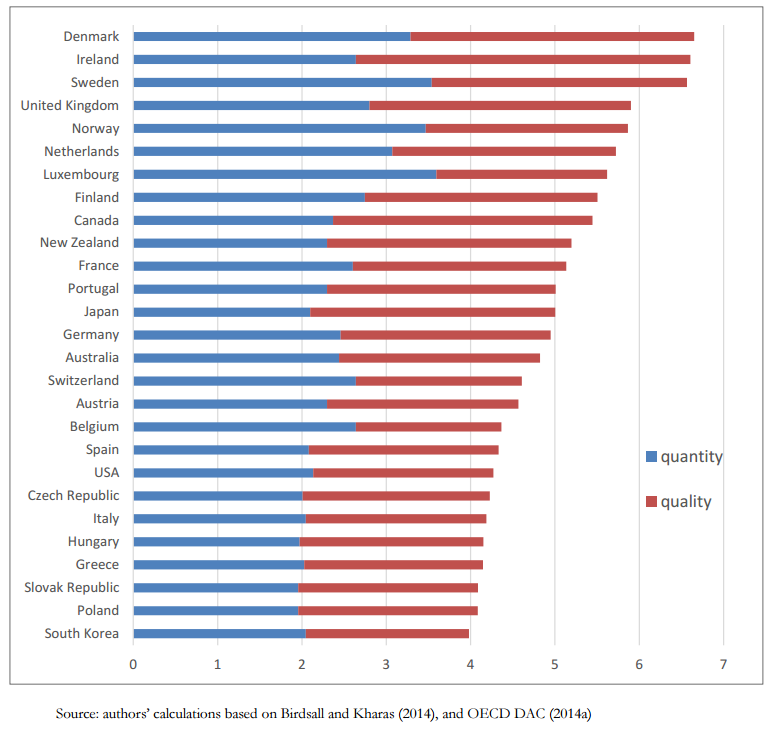 In the CDI we assume that quantity and quality are equally important in the sense that the variance between countries in aid quality counts for as much as the variance between countries in the amount of aid that they give. On this basis for combining scores, Denmark—which is neither the most effective nor the most generous donor but does reasonably well on both—pulls ahead of Luxembourg (the most generous) and Ireland (the most effective). Finally, our figures suggest that aid is a “luxury good” in the technical sense that it tends to increase more than proportionately as incomes rise in donor countries. As a result, countries with higher incomes per head give a higher proportion of that income as aid (and do so relatively effectively). 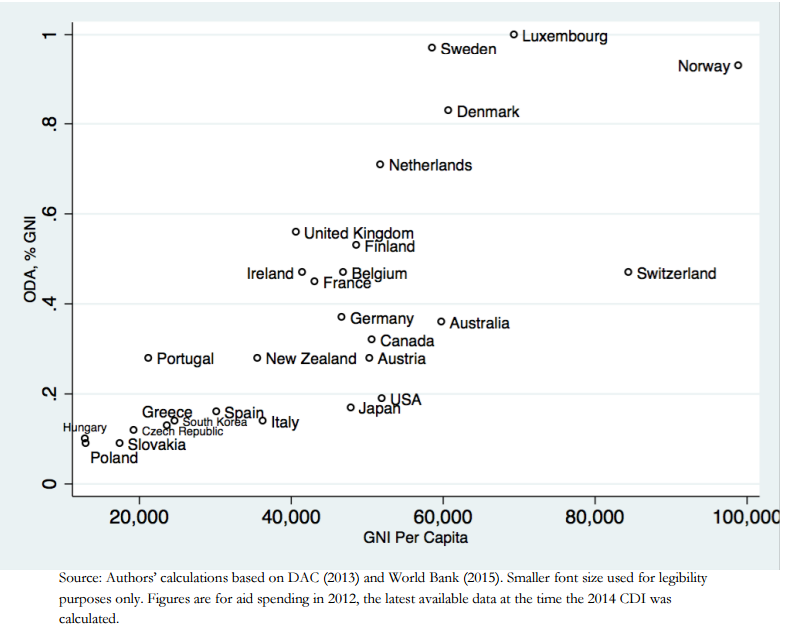 Outliers from this positive correlation between income and generosity and effectiveness are Switzerland, the US and Japan, all of whom are relatively tightfisted for rich countries; while Portugal, Ireland and the UK punch above their weight. Aid is likely to play a relatively small part in meeting the Sustainable Development Goals—but to the extent that it can play an important role, we all want aid to be both generous and effective. The impact of aid depends not only on the amount of money that is given, but whether it is used well. A question that immediately comes to mind from this piece as well as the traditional development literature is why % of GNI is considered the appropriate barometer of aid given and not total amount distributed/spent. It seems to me that this metric exists mostly as a tool to encourage the large nations to give more but does not appropriately demonstrate what “quantity” intuitively means (more projects, larger scale, broader initiatives). I would be curious to see how effectiveness is distributed when discussing pure scale of the interventions and if there is any trend towards economies of scale and information sharing increasing effectiveness or if the trend is that countries that give less are able to pay more attention to the individual programs, thus increasing effectiveness. I enjoy this blog quite a bit. Thank you! I agree with your statement that we all want aid to be both generous and effective however, I think it is more important to focus on increasing the effectiveness of aid than increasing the quantity. We could be doing a lot more with the amount that currently goes into aid, why waste more resources? If countries want to give aid at all, they might as well make sure it is effective. It will also be interesting to explore what beneficiaries consider as effective in defining whether a development aid is effective or not. One of the challenges with aid which has made a huge portion of it ineffective over the years is that it has been more focused on the donors and what they think works best rather than the beneficiaries.